We seem to have missed the first two recordings which the Dudok Quartet made for Resonus: Metamorphoses contained Haydn’s String Quartet No.57 with Ligeti’s No.1 and short pieces by Brahms (RES10150) while Labyrinth offered Mozart’s No.14, K387, with Ligeti’s No.2 and short works by Bach (RES10180). Their latest offering, Solitude, continues the practice of combining quartets by a major pre-twentieth-century composer – here Mendelssohn’s sixth quartet – with a twentieth-century work – Weinberg’s third quartet – and shorter pieces. Familiar as such practice may be in concerts, I started with an open mind – perhaps veering slightly towards the sceptical – as to how well it would work on a CD, especially when there are so many fine recordings of the complete Mendelssohn quartets – Quatuor Ébène on Erato (review of earlier release of Nos. and 6) and the Emersons on DG (review – review), for example – and even Weinberg’s music is at last receiving its due, with Quartets Nos. 1, 3 and 10 on Volume 5 of CPO’s series, 7775662, judged by Gary Higginson ‘a good place to start your investigation of a very considerable twentieth-century figure’ – review. GH had no benchmark against which to judge the Quatuor Danel in Weinberg on CPO but their recording now serves for comparison with that of the Dudok Quartet, courtesy of the Naxos Music Library in the CPO. On this, my first acquaintance with the work, I found both performances convincing. Tempi are as close as makes no difference and the same applies to the quality of the playing – suitably intense in both cases. Like much of Weinberg’s music, I could easily have mistaken this, especially the finale, for Shostakovich on a dark night, which I mean as a compliment to its impact rather than a suggestion of derivativeness. I hardly noticed any general change of style when the Shostakovich Elegy followed. Overall, you may prefer to go for the CPO recording, with its all-Weinberg coupling, but the Dudok performance is equally powerful – intense in the slow movement – and convincing. For more Shostakovich (Quartets Nos. 9-12) and Weinberg (Quartet No.6) combined in very fine performances, try the Pacifica Quartet (Çedille 90000138 – review – DL News 2013/11). In Mendelssohn, of course, I had many more potential comparisons. Easiest to hand was the set performed by the Cherubini Quartet of Nos. 1-6 on Warner Triples 5008572, 3 CDs, even better value as I write for around £7 than when I reviewed it and recommended it as a very good runner-up. Op.80 is a very moving work, written as an elegy for his talented sister Fanny. I thought the Cherubinis a little lacking in intensity in the opening movement, perhaps because they try too hard to integrate the late-Beethoven-like disparate elements in the music. 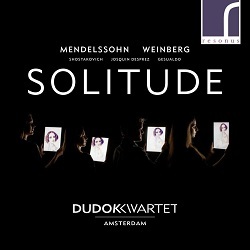 The Dudok Quartet immediately convey the composer’s sense of loss – hence the album title Solitude – and grief. They achieve the intensity, too, with playing that’s a model of togetherness. The adagio third movement carries the weight of Mendelssohn’s grief. I’ve compared its power to that of the slow movement of Schubert’s String Quintet in C, and I thought the Cherubinis a trifle lacking by comparison with the classic Æolian Quartet account of that work, then recently reissued by Regis but now available from Alto, still at budget price (ALC1278). The Dudok Quartet come closer than the Cherubinis to achieving that ideal of thoughts that lie too deep for tears. With equally fine performances of the other works, and recording and notes1 to match, if you like the coupling, I see no reason not to recommend this new release. If you didn’t already know Mendelssohn’s quartets, this performance may tempt you to investigate the Cherubinis at such a give-away price. Or, still in the budget-price category, the Elias Quartet in Nos. 2 and 6 and the Four Pieces, Op.81, reissued on Alto ALC1303 – review. The transcriptions of Josquin and Gesualdo on Resonus neither added to nor detracted from my enjoyment of this recording overall. The coupling of the main pieces, however, worked surprisingly well for me; if it works for you, go for it. The title is appropriate for the Mendelssohn, with the members of the quartet looking at pictures of his sister Fanny on the cover, but I’m not sure it works so well for the two ‘isolated’ Soviet composers. No matter. Having written the above and converted it to html, I turned to the next CD in the to-do pile and it was the Minguet Quartett’s second volume of the Mendelssohn string quartets, which reminded me that their first volume had contained No.2 and No.6 and that Gavin Dixon had contributed a very positive review of that recording. Well, it was six years ago – why the long interval before volume 2? – and my memory isn’t what it was. I listened to that earlier volume courtesy of Naxos Music Library and it was apparent what had caught GD’s attention. If I was slightly less impressed than him, the reason is inherent in his description: these are slightly understated performances, with slightly less of the Beethoven-like energy in the first movement and slightly less of the grief for Fanny in the third. I could readily appreciate, however, that many will prefer the Minguet Quartett recording for that reason. (CPO 777503-2). Before I move on to their second volume, one more recording of Quartet No.6 has appeared recently, from the Doric String Quartet, with No.1 and No.5, on a very well-filled Chandos 2-for-1 offering (CHAN20122 [85:48]). Beware of dealers who are charging for two CDs or as for a 2-CD download! Having obtained this in 24/96 sound from chandos.net, I’m planning to include it in a forthcoming edition of my regular Second Thoughts and Short Reviews. I can, however, report that my initial findings are that this is a (very) strong contender which, I hope, augurs well for a complete series from these performers. They take a whole minute longer than the Minguet Quartett in the third movement and deliver a more heartfelt account as a result. They even give the music a little more space than the Dudok Quartet and, perhaps, catch more of the music’s affective force thereby. There’s no SACD or surround version, but the 24-bit download is very good and only slightly more expensive than the CDs. And so, finally, to the Minguet Quartett on CPO 777931-2. Theirs is not the only recording of the early E-flat work – most complete recordings contain it, though not the Cherubinis. 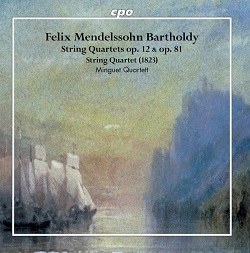 Even early works by Mendelssohn are far from negligible and it’s understandable that CPO would wish to include it. The Escher Quartet provide strong advocacy for it (BIS-SACD-1960, with Nos. 1 and 4 – review). Like early Mozart, however, it’s enjoyable but hardly outstanding, and, while both ensembles make a good case for it, I prefer the Eschers’ decision to place it between the two other works rather than have it at the end. With No.1 included on that BIS recording, too, it makes sense to compare the Minguet and Escher albums. The BIS benefits from availability on SACD and in 24-bit sound (stereo and surround) from eclassical.com. As with No.6, the Minguet Quartett take the third movement (andante espressivo) of No.1 rather faster than most, half a minute faster than the Eschers, and, one might expect, slightly less espressivo as a result. In the event, however, I liked the two approaches in about equal measure, and the CPO ordinary CD sound is very little inferior to the BIS SACD. Both recordings mark the advance of this, Mendelssohn's first official quartet, over its student predecessor. On the other hand, both Escher and Eroica Quartets throw yet another recording of No.6 – and No.5 in both cases – into the mix, and very fine performances they are, too, with powerful accounts of the third movement. To sum up: the Minguet Quartett seem to be inching their way towards a complete set of the Mendelssohn string quartets in performances which, while they may not be the most profound, are very satisfying. Neither they nor the Dudok Quartet challenge the complete sets which I’ve mentioned or the separate releases from the Eroica Quartet on period instruments, now download only but well worth considering, or those from the Escher Quartet on BIS. Much as I enjoyed both the CPO volumes published to date, my overall recommendation would be the Eroica or Escher – but watch out for forthcoming volumes from the Doric Quartet who, I expect, will be adding to their recent Chandos release. Only the Escher Quartet are available on SACD, and only they and the Doric Quartet can also be obtained in 24-bit sound, but the Eroica and Minguet sound well enough in CD/16-bit guise for that not to diminish their value. The Resonus appeals by reason of its themed programme. The CPO will satisfy those who like this music a little on the cool side, but more profound performances are available elsewhere. 1 But was Mendelssohn not so much ‘wrecked’ by the death of Fanny as ‘wracked’ by grief? Neither is an exact translation of the original Dutch word kapot.